Note that this pattern cannot be set via the Interior Inspector - use the Plot Inspector. The pattern requires configuration via its parameters. This pattern can be used in shaped notes. 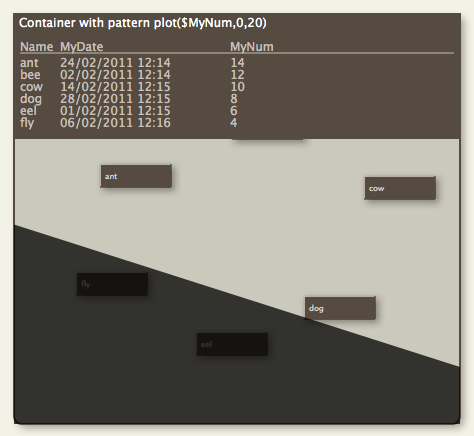 This pattern is only available for use in container plots and has no visual effect if applied to other objects. The graph is drawn in the form of a sparkline-type plot across the viewport area of the container. The graph is drawn in colour $PlotColor. The container viewport is still accessible for drag/drop, etc. as if the plot weren't there - think of the plot as an overlay. The Y-axis of the graph will run from the minimum value of the specified attribute - for the notes being plotted, to the largest value. An alternate plot type is bargraph(), which draws a bar graph of each child item's value or xyplot() which draws a sparkline-type plot but where data can be specified for both axes. The background of the plot is set via $PlotBackgroundColor with opacity of $PlotBackgroundOpacity.